If a cable car, with all its manifold negative impacts, could not provide better access to the mountain than the existing roadway and tracks, its case would collapse; and so the Mount Wellington Cableway Company boasts that a cableway would offer the ultimate access: "all-year and in all-weather". Would it? If the mountain were the Louvre Museum, the MWCC proposal would be a glass tunnel with a ticket box at one end, the Mona Lisa at the other—and too bad for any galleries or artworks in the way of the tunnel. In considering Access to the mountain generally, how many places on the mountain would a cable-car access? The more the better, surely, but the answer is one place. The cable car would be nothing more than a shuttle service between the foothills and the Pinnacle. Would the cable car provide 24-hour a day access? No. How many hours a day would a cable-car provide access? The answer is: only the hours when it is profitable to do so. The cableway provides access only during business hours. Are there any days the cable car would be unable to provide access? Answer: At least 16 days—if the MWCC's figures on maintenance and wind are accurate. And there is evidence that the MWCC has minimised the wind and maintenance disruption times. How much will this cable car access cost? Somewhere between $50 and $90 per person. Compare these answers on cable car access to the roadway. The Pinnacle Road has infinite stop-offs, it is open night and day, is almost never (fully) closed for maintenance, is closed by snow or ice for less than 16 days per annum and costs about $4 in fuel for four people in a standard sedan. No cableway could offer better access to the entire Mountain than the roadway. The cableway company points to the weekends or public holidays when the sun is gleaming gloriously onto a big dump of fresh snow—and the road is either temporarily or closed all day. Queues mount, parking is limited, disappointment is high. Any and every delay is frustrating to the impatient. Denying access, notwithstanding the safety, is a significant issue on any day. On perfect days, it is worse, but it is not uncommon in many venues. Capacity is capacity. But how often does this occur? A handful of times a year. Fortunately, the mountain is never fully closed. The tracks are open. In short, there may be arguments for a cableway but "all seasons, all-weather access" is not one of them. The only way the cableway could provide better access would be if the road were to be closed, but no one is going down that road, are they? The MWCC is a major critic of the Pinnacle Road itself, claiming that it is worn out, dangerous and requires improvements that would cost millions. That, too, is misinformed, but closing the road is not an option. READ MORE ABOUT: The Pinnacle Road. In MWCC videos, photos and text the Pinnacle is typically shown as perfectly comfortable: still, dry and warm; or with whispy, misty clouds and fresh snow—an impression crucial to the selling of the journey. Bureau of Metereology records tell a different story. 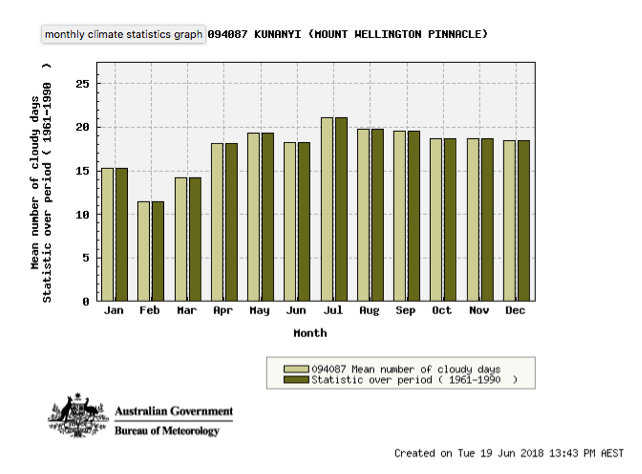 The Summit of kunanyi/Mt Wellington is Hobart’s wettest place, one of the coldest places in Tasmania (but is infrequently snow-coated), is cloud-covered for 50% of the days of almost every month and holds the record for the highest wind speed in the state. The cable car is designed to carry passengers high in the air through a gale—whole trees bending below you, flying twigs hitting the cabin, to a place with winds more severe. Who will want to go up the Mountain in the freezing cold, stumble about in the fog until blown into an ice puddle? Soak in the scenery... Breathe crisp clean air. Skim misty clouds. Frolick in fresh snow.